In one of my previous posts, I talked about the launching of Gtbank Virtual Mastercard and all it's features and benefits. 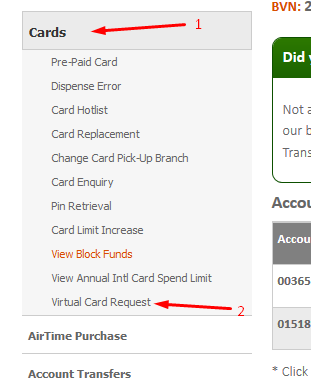 This time around, i want to share with you the step-by-step guide on how to request for the Gtbank virtual Mastercard through the internet banking interface. The GTBank Virtual Mastercard is an online card that can be used for making payments wherever mastercard is accepted online, it is safe, secure and fast to obtain via the internet banking platform of Gtbank. You may click here for full details of the Gtbank virtual Mastercard. 4. Click on "New Request"
5. Select the account that will be debited for the charges and choose the account that will be associated with the card by clicking the box before it. That's all! Got any contribution or questions regards this post? Kindly put it in the comments section below this post. Nice one, it is indeed safer for online transactions. All i need to do is to just transfer the exact amount i need for the online transaction. You have shared such an important information, It will help me to get gt bank virtual master card from your given ideas without going bank. Get every type of easy to use and affordable US Virtual Bank Account solution in USA.